Things are rough out there. And not getting much smoother by the day now, are they? But we still gotta eat and drink. So, one might argue that in the absence of a quick surgical fix to our economic ills, the best therapy we can give ourselves is good food and wine. Not that anyone wants to spend a lot on either. Fortunately, cost-conscious food and wine pairing can work fabulously, for the simple reason that these table partners naturally elevate each other. The most humble vin or vino perks up with simpatico nibbles. And vice versa. It makes sense. You know that Italian wine melds easily with Italian food, and French with French. Now is the perfect time to embrace pairing cheap wine with cheap eats. Lemon-Ricotta Spread. Take a small container of whole milk ricotta; stir in a teaspoon or so of lemon zest, a twist or two of fresh pepper and dollop of kosher salt. Chill overnight and voilá: you have an ethereally light, assertively creamy, lemon-charged spread that works on just about any sort of cracker, bread or toast. If you want to get fancy, add a little more zest on top, or sprinkle with a little finely chopped green herb such as mint, parsley or basil. Wine-wise, you are golden with any light, modestly priced white. Italian Prosecco and Pinot Grigio are nice, simple fits. Austrian Gruner Veltliner, which acts like Pinot Grigio with more kick, works, too. Best bargain of all may be crisp, lean, dry South African Chenin Blanc. Sometimes called “Steen,” most SA CBs reaching the U.S. are well-made and under $10. The 3 “G” cheeses—Goat, Gouda and Gruyere. Goat cheese is kinda boring on its own; chalky-dry, plainly tart, gluey. But take a cue from where goat cheese—or, shall we say chèvre—developed: in the Loire Valley, where Sauvignon Blanc rules. We’re not on a Sancerre budget today; so take any $10ish Sauv Blanc from Chile or NZ or California and watch it cast a mellowing spell on the goat cheese. Gouda is here because it’s basically grown-up cheese for the mass palate; the mild flavor but generous texture of Gouda elevates simple fruity reds and whites alike. And the Gruyère…well, now we’re talking real cheese—pungent, rich, tangy/nutty/creamy. This G cheese is pricier than the others, but it works great as small chunks or slivers (room temp), where its assertive character counters woody Chards and earthy red table wines. Caramelized Onions. Yes, you will stink up the house—maybe even the hall or ’hood—but naturally sweet-’n’-savory caramelized onions are dirt-cheap to prep and killer with aromatic whites. The main ingredients are heat and attention, as the onions reinvent themselves into a nice brown mess over time. The results keep well in the fridge, and a little can go a long way—dabbed into pastry cups; spread on pizza; or given the full-blown tart treatment (bacon optional!). Riesling rises to new heights with caramelized onions; same for Alsace whites in general, even humble edelzwickers (blends). Other aromatic whites that meld well: Albariño, Mâcon-Villages, Torrontes and Viognier. Magic Salami. A red wine’s best friend may well be charcuterie. 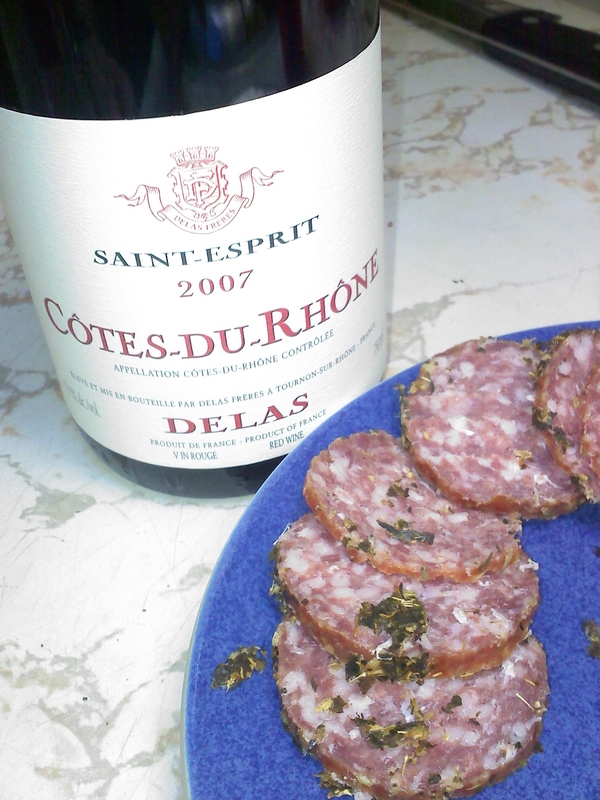 But if you need to have just one sort of slicing meat, let it be the magic salami, coated with herbes-de-provence. I buy the Busseto “Maître d’” brand for $6-$8; it’s a French pork and beef salami. Sliced thin, the salami grabs hold of the tumbleweed-like herbs. The net result when eating is that while the protein and fat of the salami coat the palate, smoothing any tannic edges in the wine, on top of that you get the earthy flavors of thyme, rosemary, lavender, fennel, et al. Amazingly flattering to straightforward country wines—Côtes-du-Rhône, Languedoc, Montepulciano d’Abruzzo, to name a few. Chorizo Buttons. Get some real chorizo from Spain (Palacios is a great value) and slice it so the pieces look like thick coins. Start a thin pan-coat of olive oil and cloves of garlic over medium heat, then add the sausage. Cook until the edges brown; remove with a slotted spoon to paper towels; pat dry. A bonus here is that you are cooking off a lot of the fat, yielding “buttons” that have a jerky-like concentration and chewiness. Break out your most basic Spanish reds—Garnacha, Tempranillo blends—or Argentine Malbec—and watch the chorizo make them even tastier. As with the salami, it’s not just the meat, it’s the spicy edge that makes a difference. — W. R. Tish is the editor of Palate Press, as well as a blogger (The Wine Skewer) and wine event specialist (http://wineforall.com). For the FTC-minded readers out there, he has done work for multiple wine regions of France and Spain. Some great ideas though I have to make a slight disagreement about Gouda vs Gruyere. I love Gruyere but a 4 yr old raw milk Gouda is “weak in the knees” good. It is nearly the perfect red wine cheese and can make even a $8-10 Columbia Crest taste like a $20 wine.